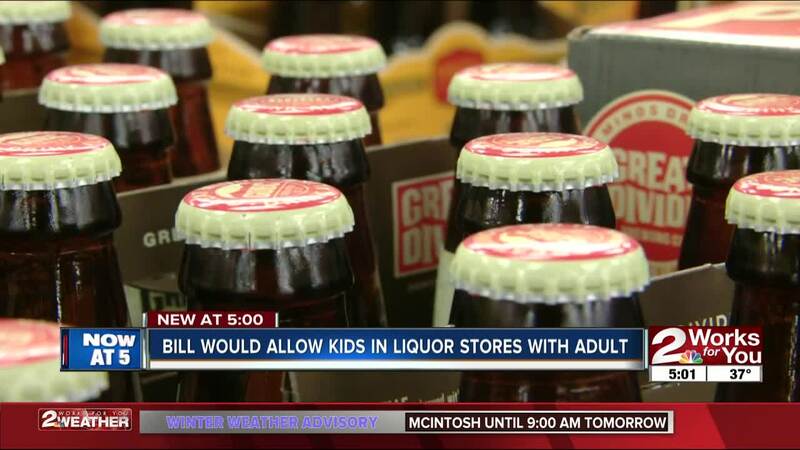 TULSA, OK (KJRH) — A proposed bill would allow children 12 and under to go in liquor stores with an adult. Officials say it’s designed to make shopping easier for parents, and get customers back in the door. For parents, it's now easy to go in to the grocery store to pick up wine and beer, but it's not the same case at the liquor store. Some liquor stores reported a dip in sales after grocery stores began selling wine and beer, so Senate Bill 820 aims to even the field. Many parents are excited at the idea of being able to keep their kids with them as they go in. "It's convenient - a lot more convenient," said Rebecca Pratt. "As a single mom, I work full-time and go to school full-time, so it can become quite difficult to find time to go to the liquor store - especially if I have my child with me." Officials at the Oklahoma Beer Alliance say some liquor stores were losing business to grocery stores, where parents are able to take their kids and get their shopping done while also getting wine and beer. The bill is aimed to provide some relief to those liquor store owners, while making shopping easier for parents. If the bill passes, it would take effect in July 2019.